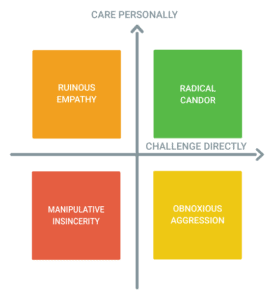 If you’re interested in bringing Radical Candor to your organization, we’re here to help! To assist your roll out of Radical Candor at your organization, Candor, Inc. can provide training and coaching services to your managers, L&D team, and entire organization. We’ll lead in person workshops that start with the high level ideas and become increasingly practical as they unfold, so that your teams are up and running at the end of our engagement. We present Radical Candor to your organization, introducing the core concepts, building a shared vocabulary, and sharing stories that will help your team relate to the ideas. We’ll then spend time answering questions and clarifying points, helping people begin to connect with Radical Candor. Then, we’ll cover tactics that everyone can put into practice immediately. After the initial introduction of the concepts, we’ll move into hands-on training to help your team further internalize the concepts and learn how to apply them in your context. We guide the team through real-life scenarios in a safe and supportive environment, and give you actionable pointers on how to practice Radical Candor in your workplace. As part of the workshops, we teach managers how to improve their feedback processes, and we help teams understand their role in the feedback process. As teams get started, we’re there to clarify and answer questions. We’d love to meet with your team to understand the particular problems you are trying to solve, so that we can customize an engagement to your organization’s needs. Contact us to schedule a time to discuss!